How are hydrogel dressings different than other types of wound dressings? 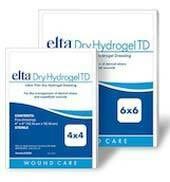 Hydrogel dressings are some of the most versatile types of wound dressings available for wounds with low to moderately low exudate. There is actually a cross linked polymer that forms the gel, allowing for consistent gel production that keeps the wound moist for enhanced healing. With the moisture kept very close to the wound and not allowed to escape through the surface of the dressing, the necrotic tissue that forms is cleaned from the wound without causing any additional risk to the wound healing process. The gel allows even low amounts of exudate to create the gel, ensuring that proper wound healing environments are created quickly when the sheets of hydrogel dressings are applied. What types of wounds are hydrogel dressings best suited for and which wounds are they contraindicated for? The ideal type of wound for a hydrogel dressing is a wound that has low to moderate exudate, but shallow or deep wounds could also make a good candidates. Forms of hydrogel dressing can range from sheets that are good for partial and full thickness wounds to wound fillers that are an amorphous dressing that can be applied to a wound of any shape or size. Most hydrogel dressings are non-adhesive, so there is not as much concern about positioning over the wound and the periwound skin. In general, most types of open surgical wounds, skin trauma, diabetic ulcers, pressure ulcers, abrasions, skin tears, lesions and sloughy wounds are all good options for use with hydrogel dressings. Wounds with high exudate or wounds that are dry are not effectively treated with these types of dressings. Hydrogel dressing can be a very versitile type of dressing if used on the proper type of wounds. Why do hydrogel dressings help in wound healing? Research in wound healing has clearly indicated that keeping the wound moist is the most effective way to promote the generation of healthy tissue. Hydrogel dressings create that environment, keeping the exudate moisture close to the wound surface and conforming gently to the wound shape. This gentle contouring of the dressing to the wound combined with the moisture held in place protects, soothes, and enhances the changes for healing and tissue growth. Another way that hydrogel dressings help in wound healing is that they remove from the wound cleanly when dressings are changed. This means that there is minimum pain or discomfort for the patient but, more importantly, no disruption of the wound tissue. Since the material in the gel doesn't break down or create fibers or debris that might stick to the wound's surface, there is not even a requirement to clean the wound during dressing changes. The leass trauma or stress that the wound experiences, the more effective and rapid the healing process will be. Hydrogel dressings are an excellent choice for dressing wounds with necrotic tissue. The high moisture levels help with debridement or removal of the necrotic tissue without the need for cleaning and manual removal of the tissue.